will give an introduction to the opera Carmen. The German-Australian Opera Grant and the Hessisches Staatstheater Wiesbaden wish to encourage all Sponsors, Benefactors and their friends to attend the German-Australian Opera Fest in Germany, and also to become hosts themselves by inviting their clients, associates or friends to this unique German-Australian cultural and business platform. The aim of the grant is to promote emerging Australian opera singers in the development stages of their professional career. 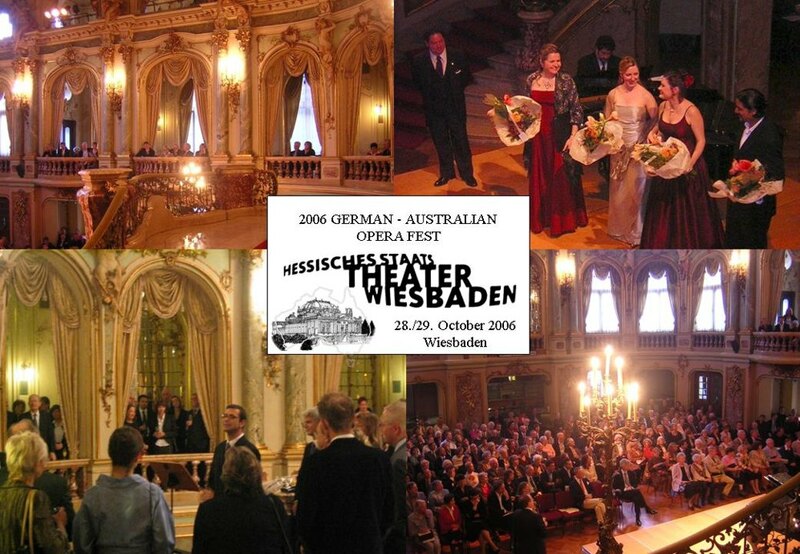 The German-Australian Opera Grant is represented by Mr Stephen Murby and Dr David Kram, Directors of More Than Opera Ltd and the German-Australian Opera Grant adjudication panel (Ian Lowe - Melba Conservatorium, Peter Mander - Monash University, Merlyn Quaife - Melbourne University, Hans Henkell - Administrator) in cooperation with the Hessisches Staatstheater Wiesbaden represented by Dieter Senft and Bodo Busse. The music is challenging, to a certain extent a "musical pastiche" with many alternating styles and forms of expression: dances, dramatic dialogues, Lieder and folk songs, arias and recitatives - a potpourri of the late 19th century. Micaela with her middle-class values of reason, family, security and respectability is anchored at the other end of the spectrum to Carmen, who stands for passion, freedom and social independence. This Frasquita is tragic and funny. She is not unalike the colourful "ladies" a person might see in the early morning hours around Sydney's Kings Cross. A comical figure from the tradition of the "Opera comique", the parody of an unrespectable petty criminal. A smuggler from the infamous milieu surrounding Carmen.